A conversation with Miranda July. 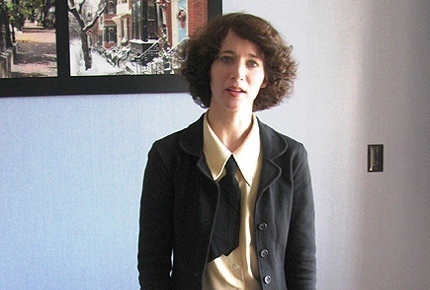 Miranda July is a ﬁlmmaker, artist, and writer. Her videos, performances, and web-based projects have been presented at sites such as the Museum of Modern Art, the Guggenheim Museum and in two Whitney Biennials. July wrote, directed and starred in her ﬁrst feature-length ﬁlm, Me and You and Everyone We Know (2005), which was awarded numerous prizes, including the Camera d’Or. July’s most recent ﬁlm is The Future (2011), which she wrote and directed and stars in. July’s ﬁction has appeared in The Paris Review, Harper’s, and The New Yorker; her collection of stories, No One Belongs Here More Than You (Scribner, 2007), won the Frank O’Connor International Short Story Award and has been published in twenty countries. Her latest book is It Chooses You (McSweeney’s, 2011).